First they banned her. Then they hunted her. Now that they caught her, 18-year-old Alex is forced to tell the story of how she joined an underground movement to reestablish the user rights and privacy laws that we, the generation of her great-grandparents, allowed to be taken away. A 21-day net ban for using an illegal tracking-blocker on her comm turns Alex into a social pariah faster than she can say “Department of Global Net & Communication Affairs”. Not long after she learns that things will never be back to normal for her. To escape the government and corporation watch lists she is now on, Alex joins charismatic Shim and his group of idealists in their fight against the lack of privacy, online and offline. But as fun as setting up a secret network and smashing spy cams as part of the fierce “fearleaders” initially is, Alex soon finds that there are different agendas at work within the group. And the playful opposition just as soon turns into deadly reality. Initially inspired by a song by the legendary German punk band Die Toten Hosen – which itself is a take on Anthony Burgess’ A Clockwork Orange – then taking further inspiration and substance from the works and talks of Canadian author Cory Doctorow, THIS WAY LIES MAYHEM has its beginning in 2010, before the likes of SOPA and PIPA became well-known buzzwords. In the two years of writing (and editing), some of the things that were supposed to be a somewhat dystopian vision of the near future have already become reality, others have come close, and yet others are looming on the horizon. But while the story is based on a very realistic threat to everyone’s rights as users and citizens – pertaining to the internet, the use of technology, and to privacy in general – this piece of near-future-fiction or literary social science fiction is just as much a cerebral adventure story about rebellion against the-powers-that-be, laced with plenty of literary, pop and geek culture references. 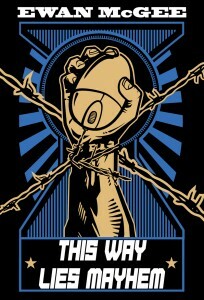 THIS WAY LIES MAYHEM is now available as an e-book in the iBookstore, on Lulu.com, Amazon Kindle and the Barnes and Noble Nook Store.